Becoming a part of an affiliate marketing programs network is a great strategy for increasing your bottom line. When done correctly, affiliate marketing is beneficial to everyone involved, generating sales, customer referrals, and new website visitors. The best part of affiliate marketing is that it’s basically risk-free for both sides. The affiliate marketer only pays the referral fee when a lead is generated. There are many affiliate marketing programs on the Internet today, making it difficult to find the right program for you or to stand out in the midst of other affiliate marketers. So, how do you make sure that your foray into affiliate marketing is a success? Before you jump on the affiliate marketing bandwagon, let’s take a quick look at what it takes to create a successful program. Niche Market: The best affiliate networks focus on a small niche market. This is vital if you want to ensure that you generate qualified leads, which have the best chance of turning into customers. A niche market also ensures that you already have built-in-traffic benefiting both sides. Compelling Creative: The creative and promotional materials should help make selling the products and services as easy as possible. You don’t want to have to do a lot of work to get the conversion, and good materials can make all the difference. Focus on Quality not Quantity: When it comes to affiliate marketing, quality is more important than quantity. A few solid affiliates can assist in driving your business much further and results in more sales. The key is to look for super affiliates who fit with your brand. Now that you know what it takes for a successful affiliate program, let’s get down into specifics when it comes to the social media niche. There are dozens and dozens of affiliate marketing programs offered by social media tools. Each offers a different set of benefits and requirements. We’ll walk you through our five favorite programs and why we chose each one. The first affiliate marketing programs: Becoming a Commun.it affiliate is a great way to earn money. 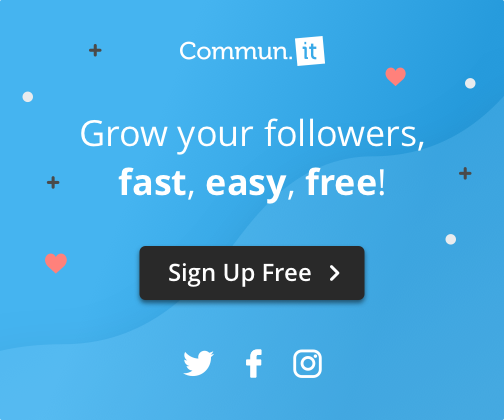 As a tool made to help manage your entire online community from mentions to followers and leads, Commun.it is an easy sell for business owners and that want to grow their community and want to know more about how to use Twitter in the online marketing community. The affiliate program is fairly simple, you get 30% of the revenue of every customer you bring into Commun.it. You even earn a small bonus for bringing in free customers. All you have to do to join is use the unique easy sharing link provided by Commun.it and place it somewhere on your website where your customers can see it. Then, every time one of your website visitors clicks on the link and signs up for Commun.it, you get the benefit in regularly scheduled payments. Earnings: 30% revenue of every customer referred and lifetime commission when a customer renews. SEMrush is home to the BeRush affiliate program. As a tool used for analyzing your social media strategy, SEO, paid traffic, and content, it’s a fairly easy sell within the content marketing space. The affiliate program is simple and advantageous. SEMrush provides all affiliates with the promo materials necessary to advertise in five different languages. Then, from there, affiliates get 40% recurring commission for every new user, commission paid for every month, not just the first one. Anyone from webmasters to bloggers, marketing agencies, and PPC enthusiasts are invited to participate in the program. Earnings: 40% per customer for every new user, commission earned monthly. Social Searcher is a free social media search engine that makes it easy to monitor social mentions across networks. The tool is ideal for quickly measuring and tracking what people are saying about your company, brand, product, service, and industry. As for the Social Searcher affiliate program, it’s fairly impressive. When you become an affiliate you can earn 50% commission for the first month’s referral followed by a 10% commission for every following month’s payments over a lifetime. In addition, the affiliate program offers 10% on second-level affiliate’s commission. All you have to do is post an affiliate link on your blog, social media, or website and send traffic to Social Searcher. And even if your referral doesn’t subscribe, you receive a commission on returning visitors for 90 days. Earnings: 50% commission on the first month, 10% commission on every following month. SocialOomph is a social media tool designed to help you boost your social media productivity. The tool allows you to schedule content, track keywords, view mentions, follow RSS feeds, and more. As for SocialOomph’s affiliate program, it’s fairly simple. To earn money, all your referral has to do is sign up for the free system and you begin earning a recurring 40% commission for the subscription fee if the customer upgrades to SoocialOomph Professional. You get a commission for the life of the referral and receive your payment every single month. They even offer a 5% commission on any referral who also signs up as an affiliate. Tailwind is a simple social media tool made for Pinterest and Instagram specifically, allowing scheduling bulk uploads, optimization, and insights. This simple tool makes it easier to handle your content for two social platforms that have few tools that work. Better yet, Tailwind offers an affiliate marketing program that offers 15% commission on every sale. When you sign up as a Tailwind affiliate you get a cookie for your website that tracks all referral transactions for 90-days giving you 15% on all sales. In addition, the program offers dozens of pre-made creative assets that you can use to sell on your website. Joining an affiliate marketing program in your niche is a great way to start earning extra money. The five social media tool affiliate programs mentioned above are just a few of our favorites. Take a look and get started on increasing your bottom line today.